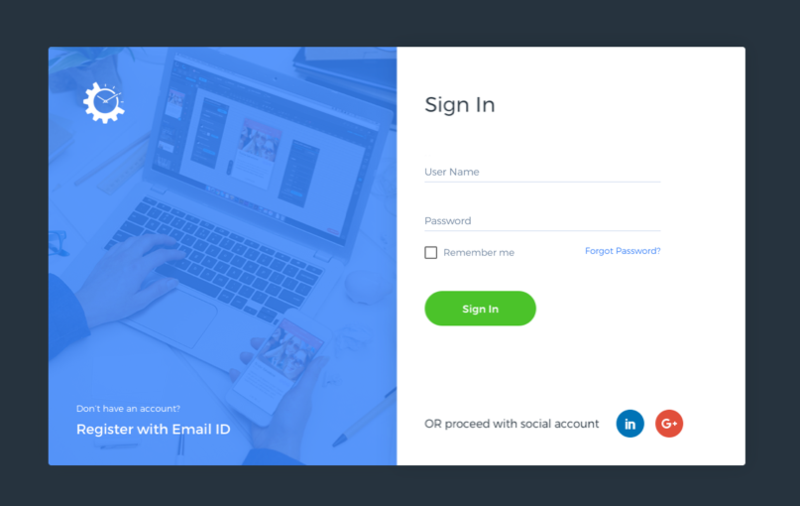 It's a screen design interface, a place where you design your screens, add properties and actions that enables the screens to communicate with your Backend, which eventually processes actions and fetches data from the database. 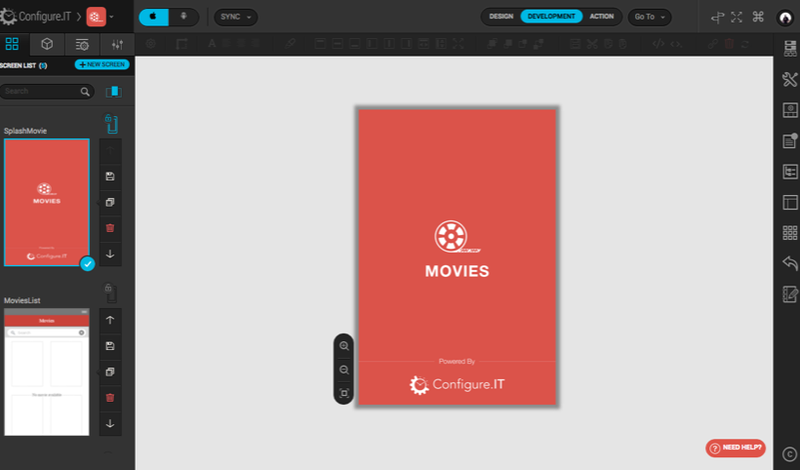 Configure.IT provides you with the pre-defined templates to ease your configuration. You can assign the groups of information like tabs, controls, screens, etc for the data collection framework to give a flexible structure to the templates. A panel where the user can configure his Database, Admin Panel and API. Application Program Interface is an interface where you define functionalities of how the Mobile screens and the database should interact by setting inputs and outputs. The API describes and prescribes the expected behavior of that component/control/object. 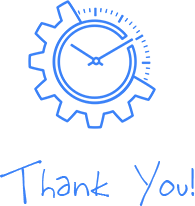 A 3rd Party API facilitates integration and grants you the requested permissions. Popular examples of 3rd Party APIs are Google Maps, Facebook, Twitter, etc. Queries allow the user to describe desired data, leaving the database management system (DBMS) responsible for optimizing, and performing the physical operations necessary to produce those results, as chosen. SQL Query Editor allows the users to execute these queries. An interface from where you can manage (add/delete/edit/view) all the data used in your application in a more friendly and synchronized manner. 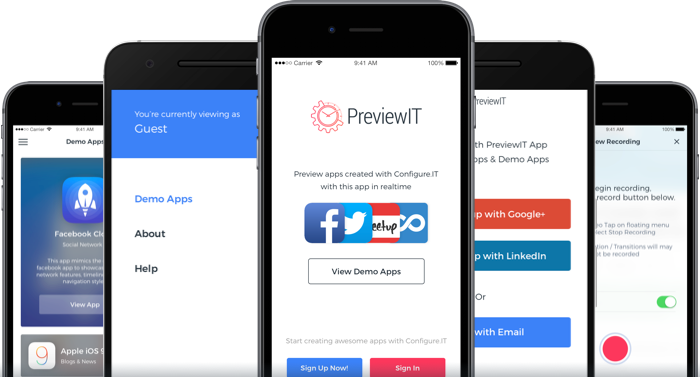 PreviewIT application is an exclusive tool developed to look at the output of your app configurations in "real time" on your iPhone, iPad and Android. The app shows native output (and not as a web/HTML app) with real data – fetching the data via API. The application offers seamless preview experience – with great productivity features to reduce time for real time review. The app requires a Configure.IT account or Preview User credentials to be able to preview app development projects. Zero Lock-in. Download full source code. Now, as you’re all set to explore the world of application with Configure.IT, let's get started! 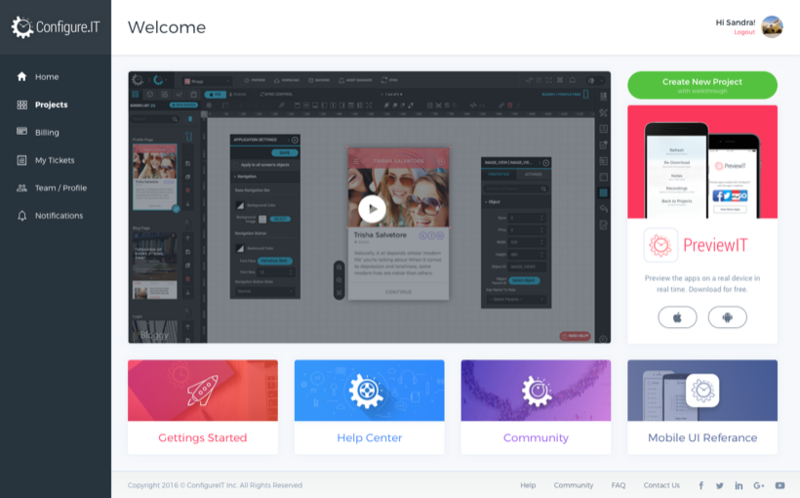 Home page or the Dashboard page presents you Learning Videos, Release Notes and important links as Getting Started, Community, Help Center and Gears App. Click on “Create Project with Walkthrough” and this will direct you to the ‘Projects’ page. All you need to do is, follow the instructions, stepwise. 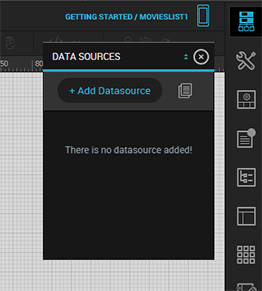 1 Click on "Add Datasource"
There are two ways to start, you can either start with blank project or choose template, we'll start with template instead of designing our own screens. It is the fastest and easiest way to understand the basics of developing a mobile application. On this page, you can select Platform, Device and Orientation. Select the template - M-Go and click on ‘Use this Template’. That’s all ! Your new project is being created by Configure.IT. This activity will take couple of seconds till your project space is being setup. Once your project is set up successfully, you’ll see a confirmation page. This page has links to all the necessary sections to start the configuration. These links will also be available on project detail screen later on. A browser based GUI tool to compose App UI and navigation flow for both iOS and Android. 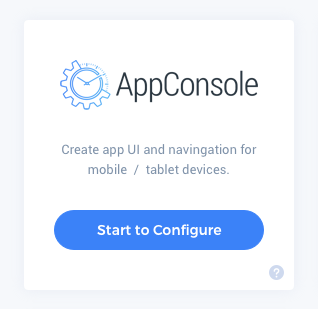 A free mobile app to allow you to preview the app on real device as you build it using App Console. Design relational database based on MySQL, PostgreSQL or MSSQL by setting up database tables, triggers and views. API Builder helps you create business logic for your application with the help of flowchart. 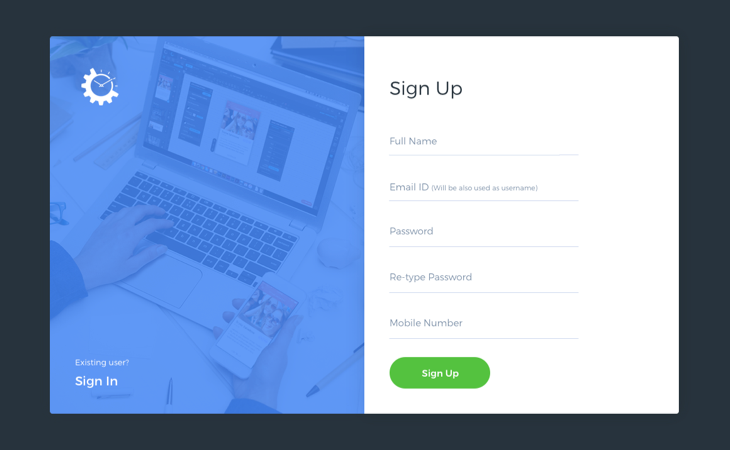 Build Data Panel, more popularly known as Admin Panel for content management for your app. OK, here’s where the real action begins. 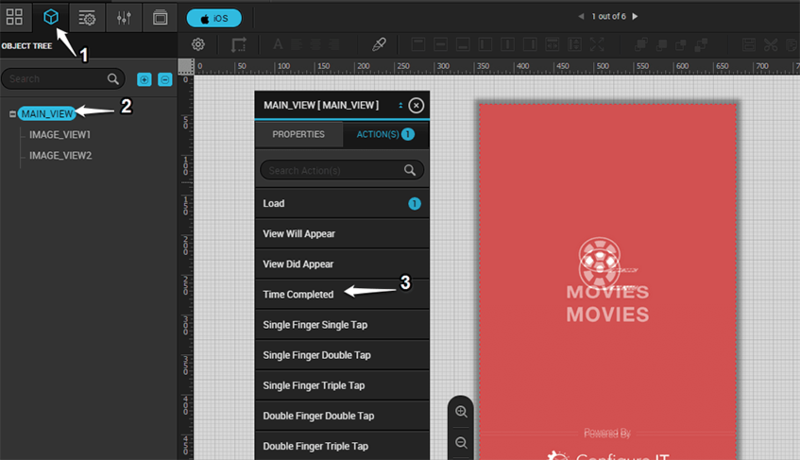 We will start with App UI, using App Console to create a new screen in the project we just created. 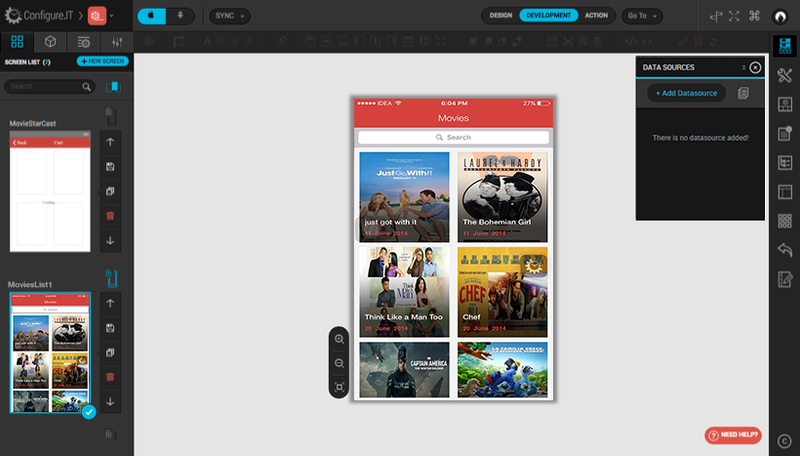 Select the first screen template "Gallery1” from the Grid option. 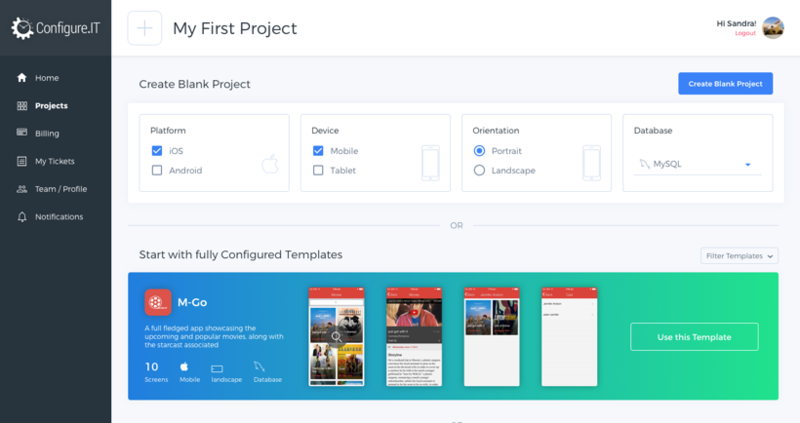 All these are pre-defined screen templates, select as per your requirement and thus you don't create and configure the entire screen from scratch. Saving of time & efforts ! This will create a new screen and will be loaded automatically in the panel. 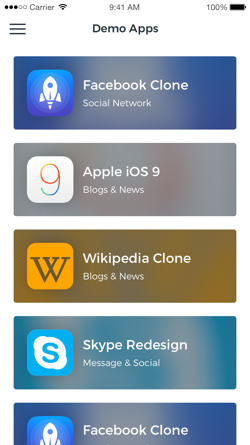 The given image displays how the newly added screen would look like. The Data Source Configuration Wizard creates and edits the data source in your screen. 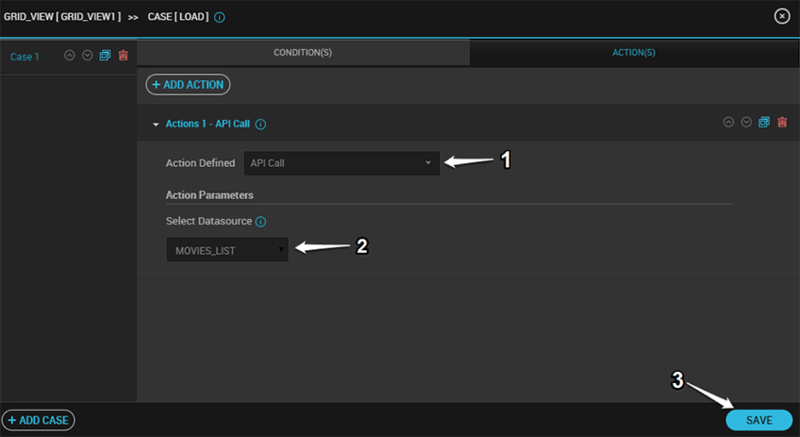 This option is available to you on the right panel of the Mobile App Console (You can refer to the above screen). Follow the steps in the upcoming slides to add the datasource for displaying the list of movies on the just configured screen “MoviesList1”. After clicking on "Add Datasource", you will receive a pop-up from where you can choose the API that needs to be added to the current screen. 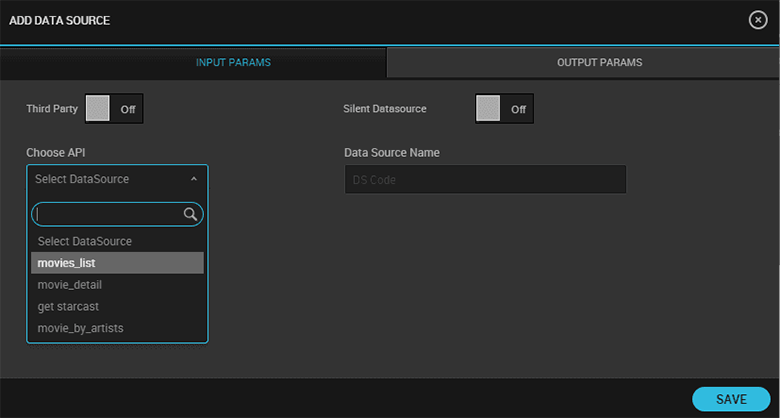 You can select the API from the drop-down menu of Select Datasource, as shown in the given screenshot. 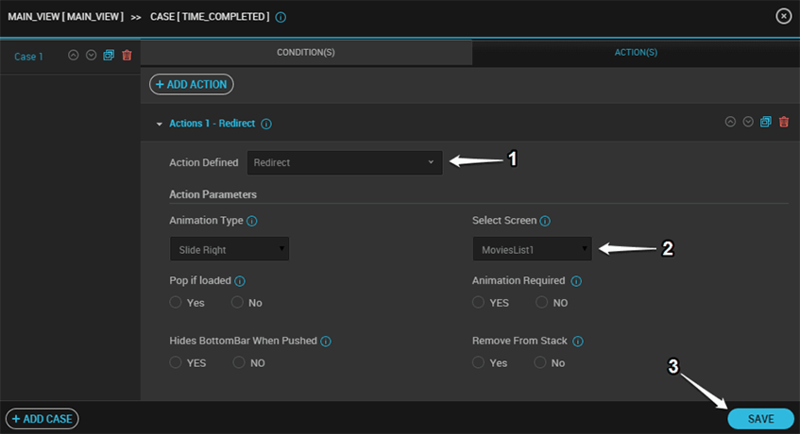 [The list of APIs in the dropdown are managed from the Backend, from where you configure your APIs using the API Configuration Interface] Here, select movies_list. 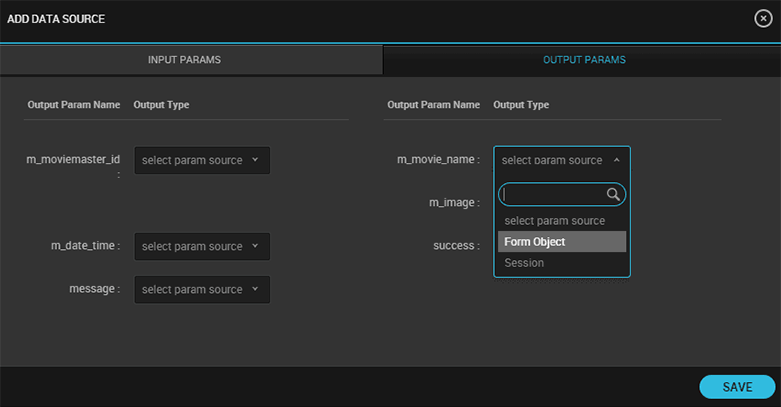 Map the given output parameters. Refer to the screen alongside for the output parameters to be mapped. Thereafter, click on "Save" button and this will save the datasource settings. 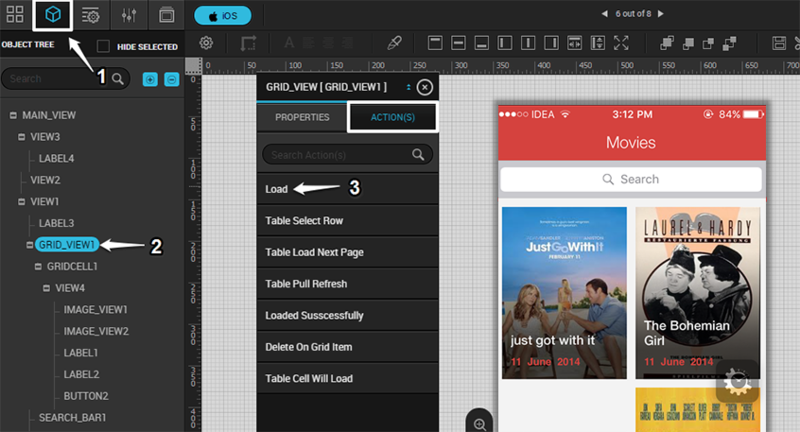 For setting the action "API Call" on the pop-up that appears for the Load event of Grid View. Now, as you have configured the iOS mobile application, lets run/preview it using our exclusive preview tool - PreviewIT App. This unique application enables you to see and experience how the end user would view the mobile app developed. To review your application on this tool, it's not at all mandatory to finish the application and submit. 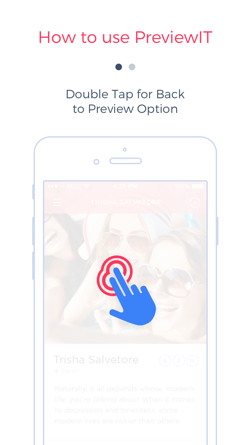 You simply need to install the PreviewIT application from the App Store / Play Store. Hence, accordingly you will have to use the PreviewIT App on Apple / Android device, to preview your application. 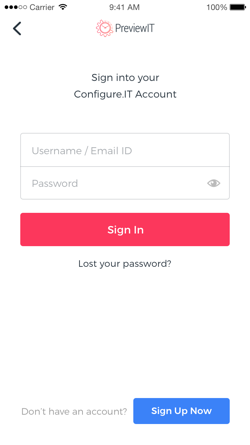 Here, login with your Configure.IT credentials and select the application that you would like to preview real-time. You can share it with your client too during the mobile app development process. Suggested changes from the clients can immediately be taken care of, which would simultaneously reflect on the previewer app screen. It is a REAL app in REAL time – for easy collaboration between teams and client. Download the PreviewIT App (iOS and Android) from the links below. 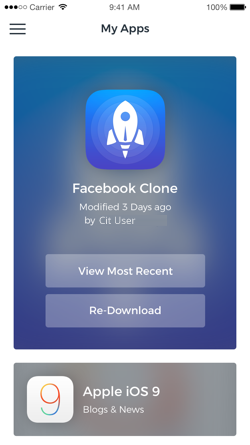 Once the app is downloaded, open the app and you will be given a walk-through of the complete application as how to use the same. 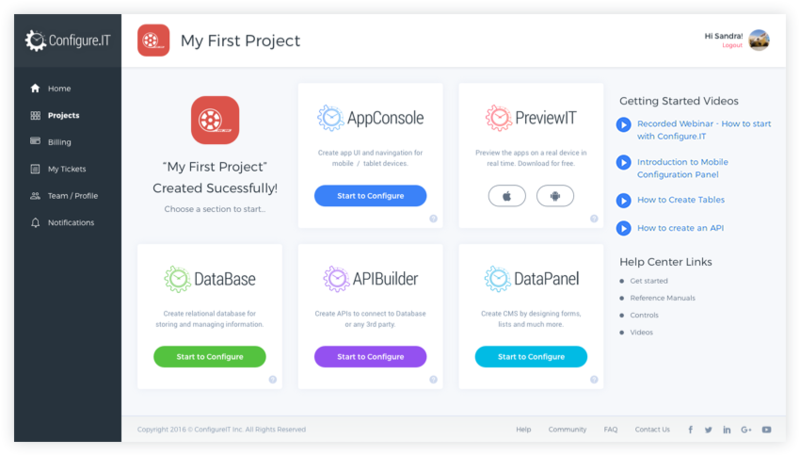 Once you Sign in using your Configure.IT credentials, select the project you want to preview. 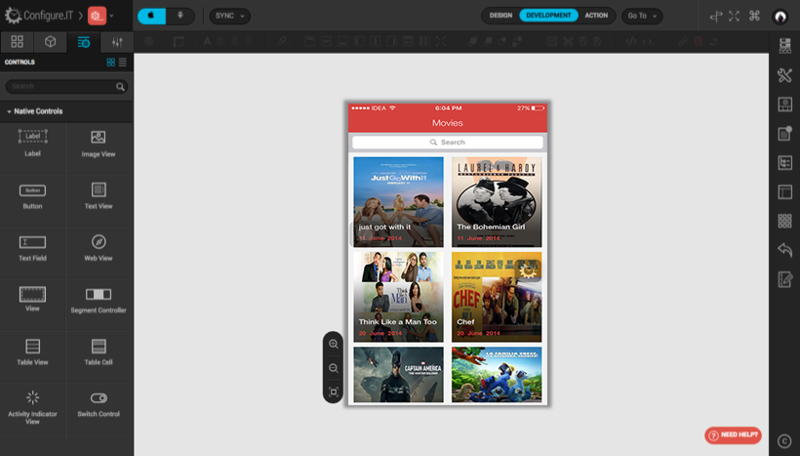 If you're opening the project for the first time, the app will download latest configurations and show you preview. We endeavor to maintain a lasting relationship with You. You can connect with us directly via Live Chat where our Support Team will assist you.